Home › entertainment › Contestant’s Original Song To His Late Brother Has Judges In Tears, His Emotional Audition Will Touch Your Heart. Contestant’s Original Song To His Late Brother Has Judges In Tears, His Emotional Audition Will Touch Your Heart. 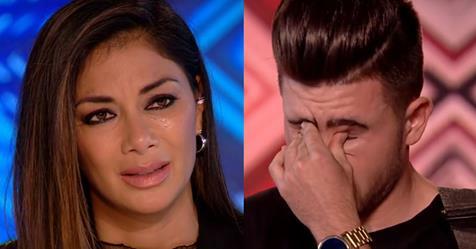 When Christian Burrows approached judges Simon Cowell, Sharaon Osbourne, Louis Walsh, and Nichole Scherzinger for his X Factor UK audition, his nerves were obvious. To be in the same room with such massive superstars is obviously intimidating, but to audition for them? The 19-year-old was shaking in his shoes. But things only get worse for Christian when Simon Cowell cut him off only a few seconds into his cover of John Denver’s “Country Road,” questioning his song choice. The sweet singer is obviously close with his family– he tells the cameras that he wants to win the X Factor so that he can get his large family out of the tiny house. So it’s no surprise that his original song is about family… But it’s more emotional than the judges could have ever expected. Watch the emotional audition below.